Welcome to Ayhans’s Mediterranean Diet, where the food is whole and the recipes are fast and delicious! 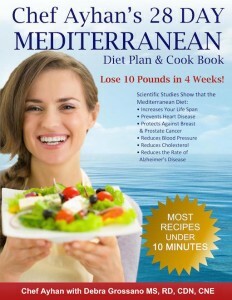 Ayhan’s Mediterranean Diet Plan is now Available in German! The cuisine known as the “Mediterranean Diet” has been called “The Healthiest Diet in the World”. It has been popular in Greece, Cyprus, Turkey, Southern Italy and nearby regions for centuries. The “Mediterranean Diet” is low in saturated fat and provides healthy mono-unsaturated fats from olive oil, fish and nuts. It features yogurt and smaller portions of meats and the heart healthy benefits of wine. The Diet is also high in fiber from whole grains, dried fruits and vegetables. In recent years many scientific studies have shown that people who follow this way of eating enjoy better health and longer lives than those who consume a western European style diet. This healthy lifestyle also is extremely effective in weight loss. Ayhan has created a 28 day plan which is simple and effective. Now you can enjoy LOSING TEN POUNDS OR MORE IN JUST 1 MONTH by using the delicious recipes and products provided in the AyhansMenuPlans® program. Ayhan’s weight loss recipes are portion controlled versions of the same delicious food guests have enjoyed in his restaurants for over 25 years. These weight loss recipes were formulated for portion control and analyzed for nutritional content by our Nutritionist, Debra Grossano, MS, RD, CDN, CDE.